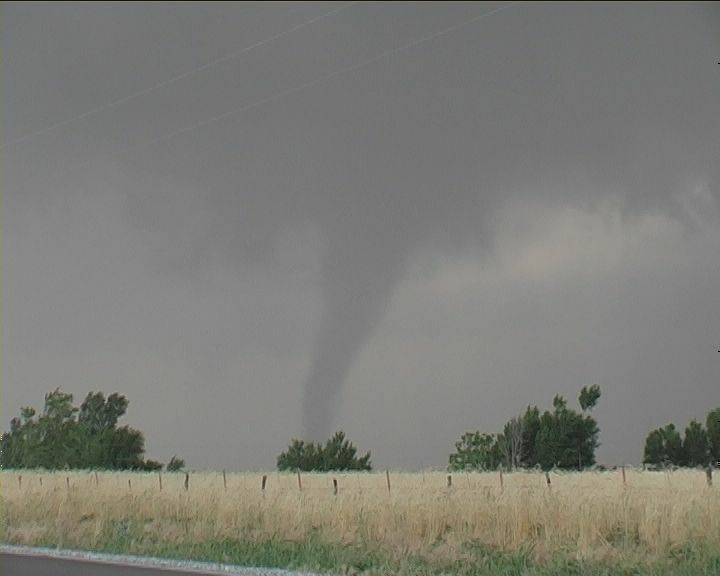 Was the anniversary of the 29th May 2001 White Deer tornado an omen for a great day? 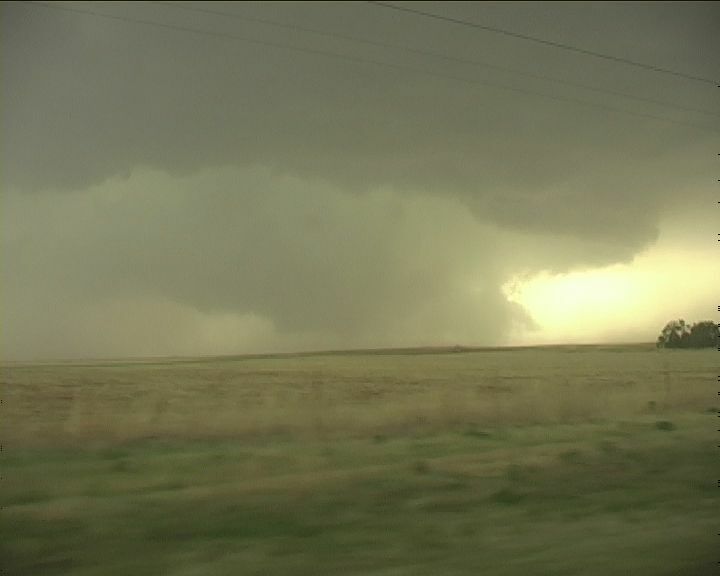 The conditions were ripe for a strong outbreak of long tracked supercells and tornadoes. Another PDS watch issued – not unexpected since it was after all a High Risk event. It was potentially a violent outbreak but this was conditional. Was it the stronger cap that would keep activity from erupting until evening in Oklahoma or was it the lack of upper level support in northern Kansas but there was a triple point up there. Southern Kansas would be the best play for upper level support. Nebraska could not be ruled out with a good backed flow but numerous storms were anticipated there. Nevertheless, it was decided to play southern Kansas and see what happens. It was to be a waiting game. The high dew points in northern Oklahoma were too irresistible so we waited just short of the Kansas border. 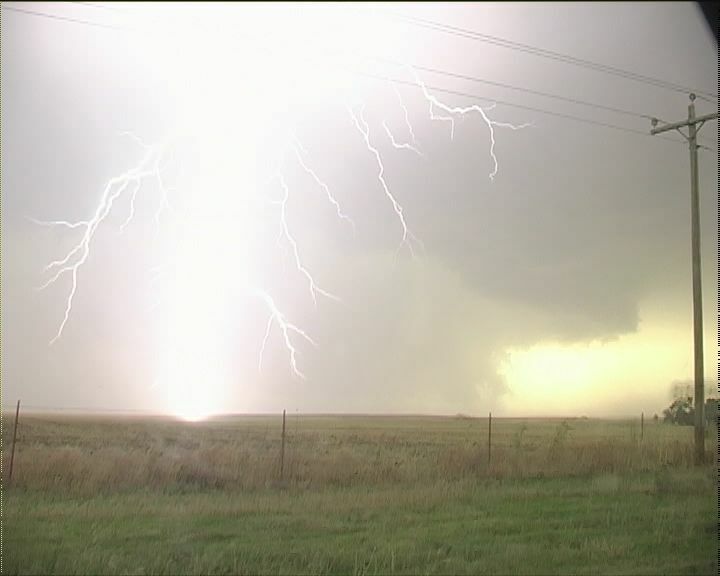 One more technicality – the Australian Channel Nine Network Sixty minutes crew had to meet up – they were in southern Kansas. The moisture haze as one would expect was thick – visibility to any storms poor. Heading west was the best option. 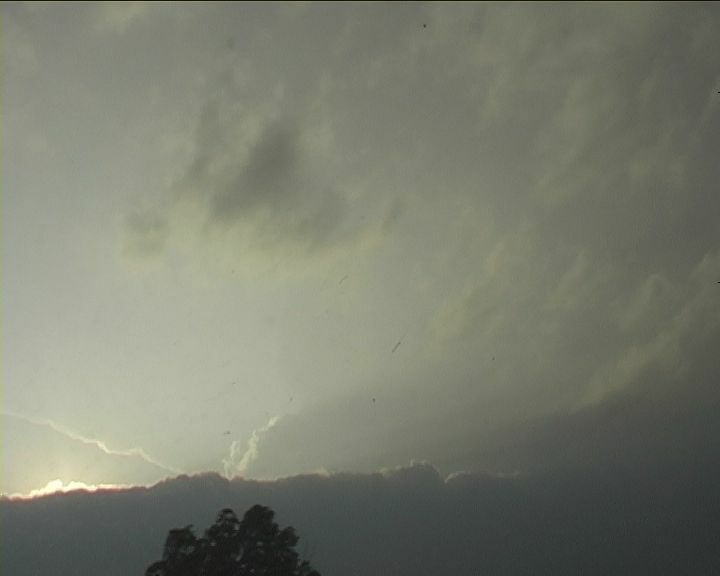 An anvil came into view but it was an hour before we were able to observe part of the updrafts. 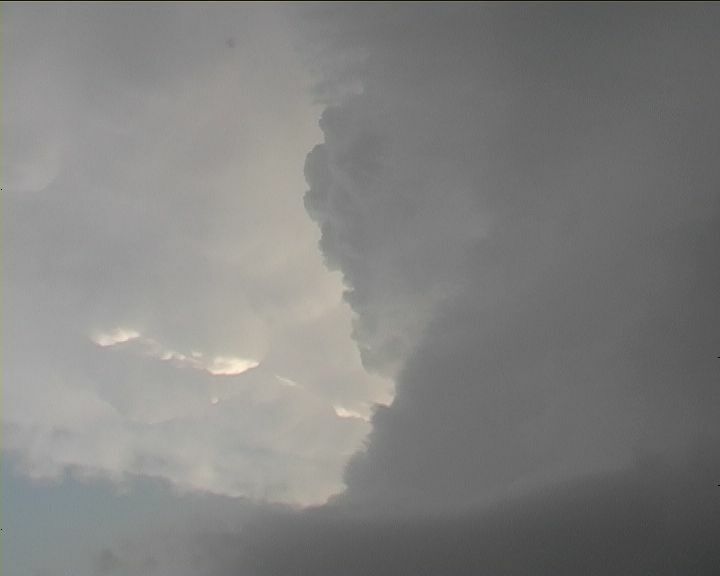 Two or more storms with anvils now separated. We ground to a complete halt on a north south road option – the Canadian River would present limitations to chasing further south. Severe warnings were not biased one way or another across the northern storm and southern storms. We targeted the southern one. But we had to wait the Channel Nine crew and there was no reception. With little time to waste we simply had to head south. The road eventually turned southeast revealing a convoy of chasers including the Doppler On Wheels crew. There were several storms in the complex but one in particular to the southwest was dominating. “Dominating” perhaps was not the word to use. Crossing the Canadian River slowly revealed a massive high precipitation supercell - HP beast by definition but with a classic structure. Not known as prolific tornado producers but this was extremely powerful. 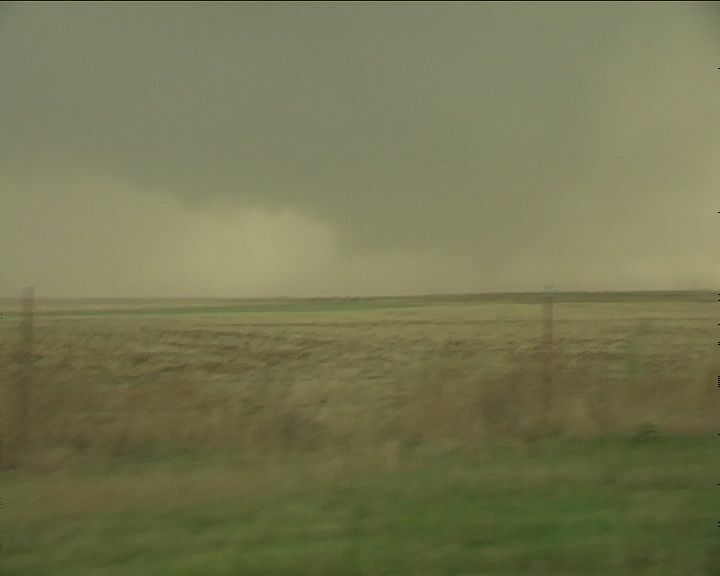 It was wrapping rain around a tornado already and the inflow literally ripping dust from the fields like sand from sand dunes - a behaviour reminiscent of June 4 2003 New Mexico HP beast. 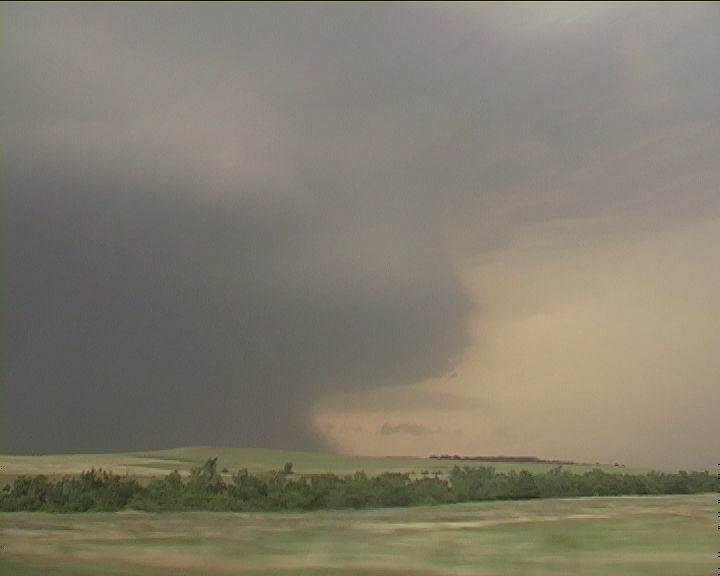 But this was by far a larger well organized HP supercell in an extreme wind-sheared very unstable environment. It was almost unbelievable. The vehicle rocked in the gusts. Lightning bolts dropping from the vault followed by the sound of loud, crackling thunder. We were shell shocked – trying to piece together what we could do in terms of chasing this thing. Forget about the rules from previous chasing – this was much larger to navigate and the road choices were not ideal. And what about the Channel Nine crew – navigating for them had become a logistical nightmare. On a normal day we would be able to send them down south to meet us but this time it was not worth the risk. Grape fruit sized hail was a certainty and even base ball sized hail would form a large component of the core. We hit I-40 to cross the Canadian River giving us better road options. 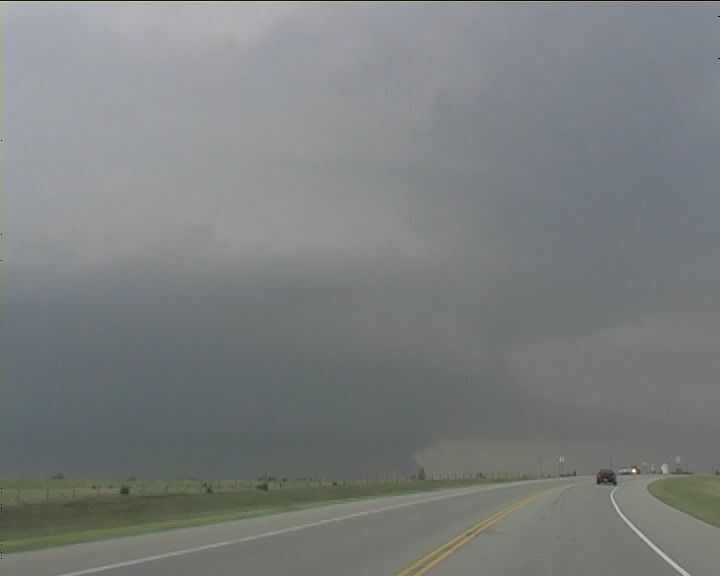 The road north to Geary revealed a massive crisp hard, supercell tower spiraling to the back-shear knuckled anvil. “Give me the camera – I have to film this”. Straight out of the text books. 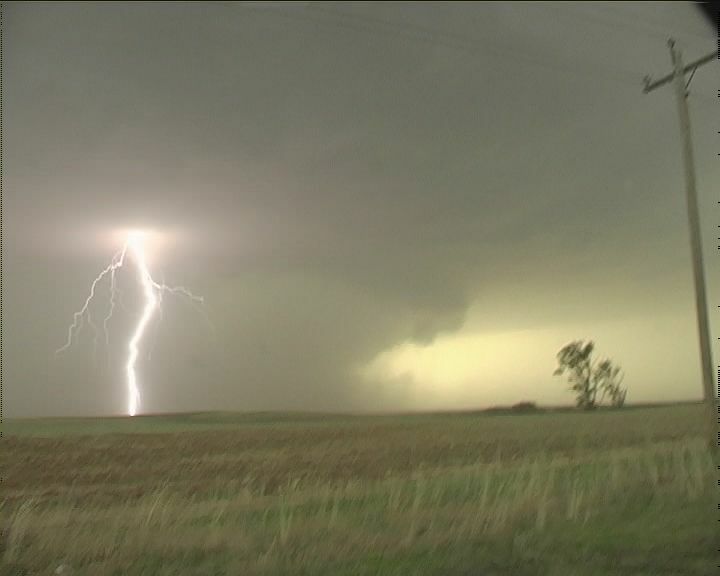 To put it into perspective, it took 90 degrees of scanning of the field of view to fit the mesocyclone alone on camera and the storm was about 10 kilometres away. 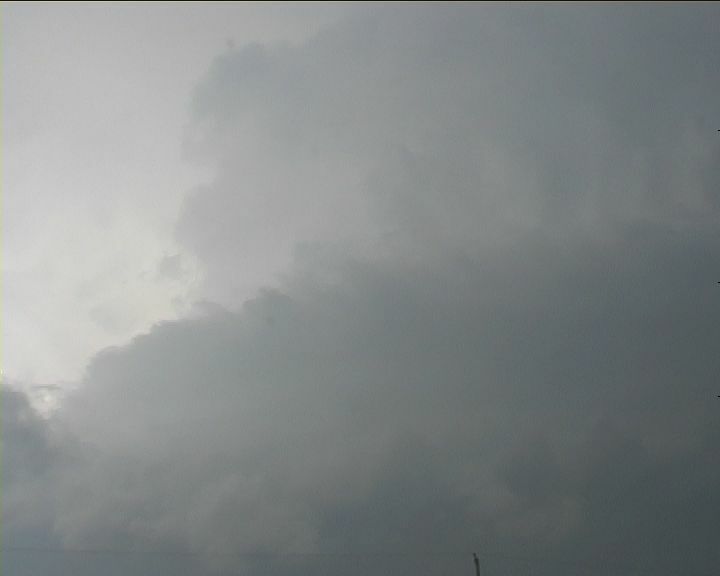 It was massive and well-organised too – definitely the largest supercell storm David and I have ever observed! 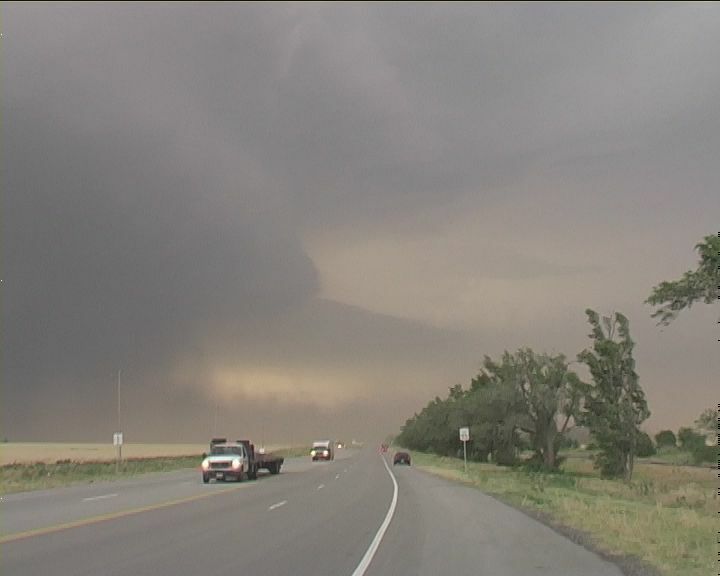 Reports on radio with Garry England reported this storm being particularly dangerous bringing flashbacks from May 3 1999. Five inch hail were being reported – five inches!! 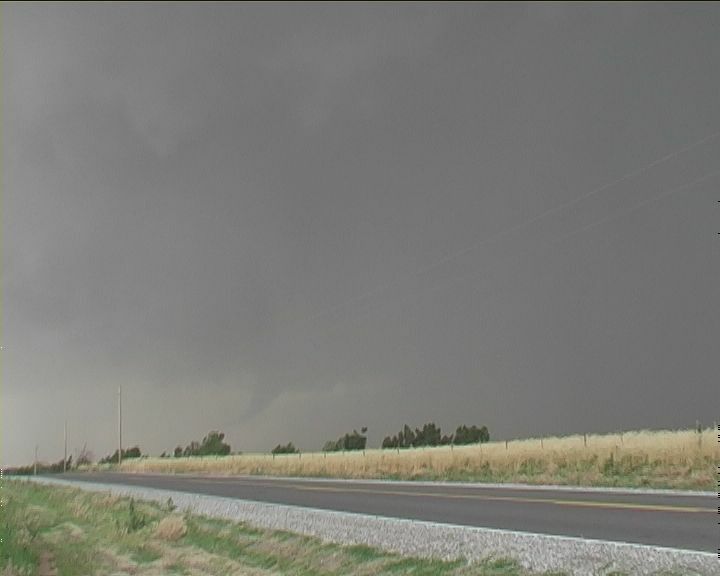 A tornado wrapped in rain as it approach Geary – that’s the town we were near. 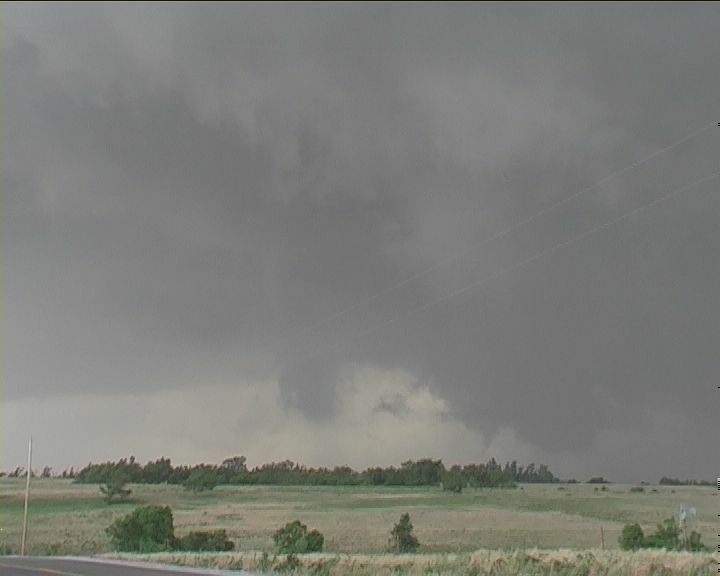 This sent a shiver down my spine knowing that we were not able to observe the tornado and yet we were so near. It was here we decided that the Sixty Minutes crew had little chance of catching up with us – time to abandon ship for them. This storm was simply too dangerous. 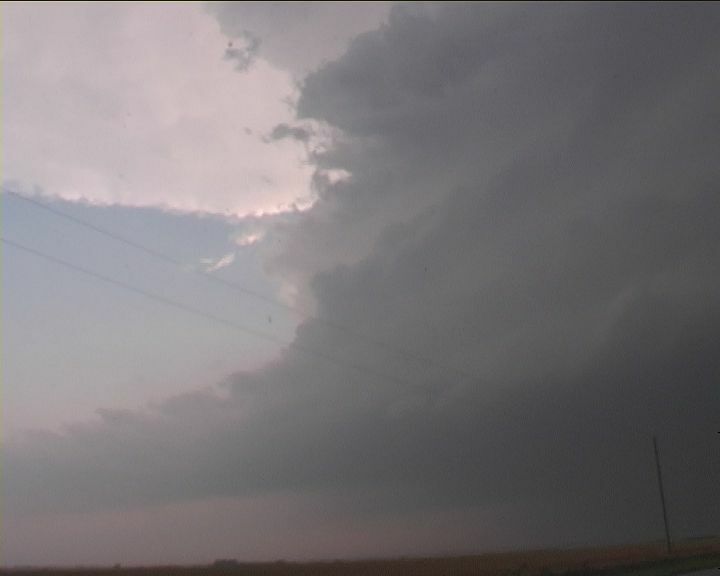 We took an east road option to get to a reasonable distance to observe the supercell and get time lapse. You have got to be kidding – when I got out and set up tripod, not only could I not keep it upright due to the strong inflow winds – the supercell could not fit in view – even from this distance - not even with the wide angle lens!! I stood there stunned! You simply could not comprehend something of this magnitude unless you were there. 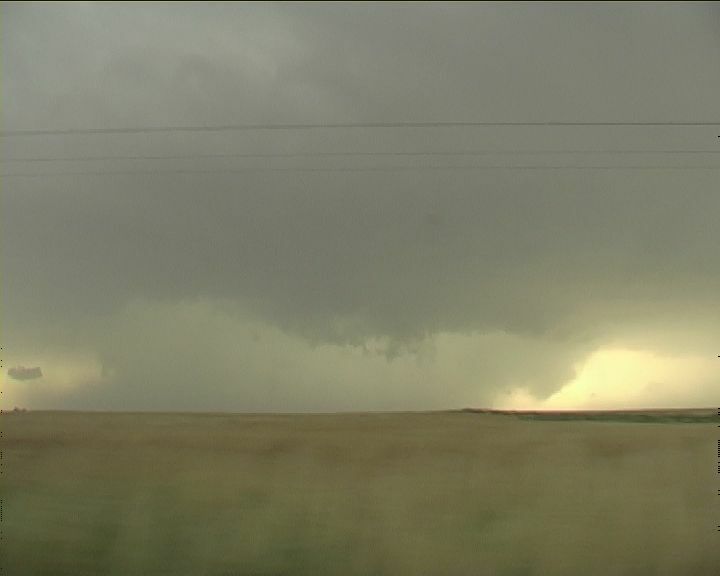 Gary England repeated warnings and descriptions of the tornado near Geary. Powerful lightning bolts dropped from the vault relentlessly. Trees and grassy fields fluttered violently in the wind. Concerned about the overhead power lines, I retreated toward the vehicle and filmed from there. It was a struggle and little did I know in all the excitement, the camera had somehow switched to auto-focus mode. With the lack of steadiness, this limited the length of quality video available from this event. 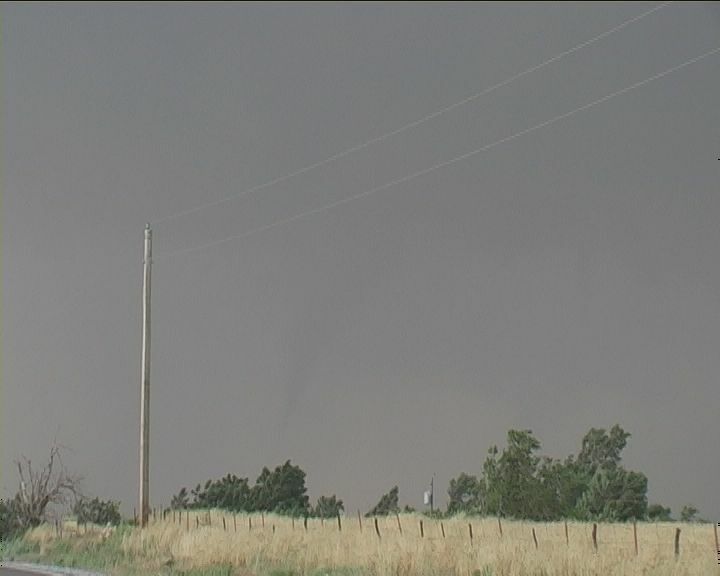 Further up the road on a hill, we finally saw the funnel cloud appear – the precipitation having eased somewhat! Rapid upmotion and rotation left no doubt that a tornado was imminent. Finally, the upmotion activity rapidly descended further down into an elephant trunk – the condensation on the ground. 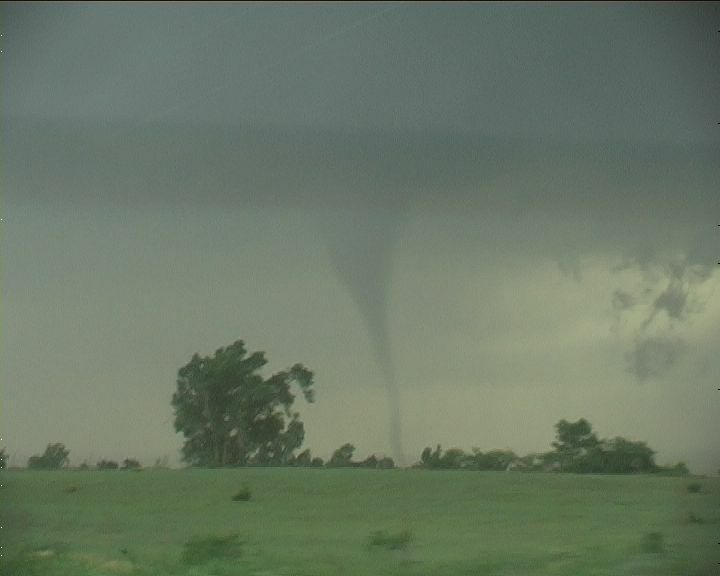 The tornado descended once more as we moved further east. The tornadoes were not long lived and were descending and vanishing rather than enter rope-out behaviour.. 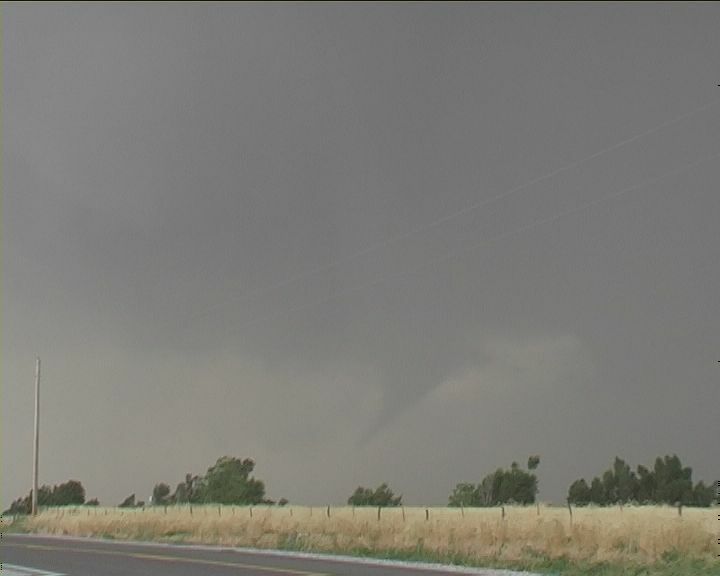 The funnel cloud persisted and another lowered wall cloud developed on the edge of the precipitation to our northwest. But there came another problem: spectator chasers hundreds of them in a convoy – few having a clue what they were doing or looking at. 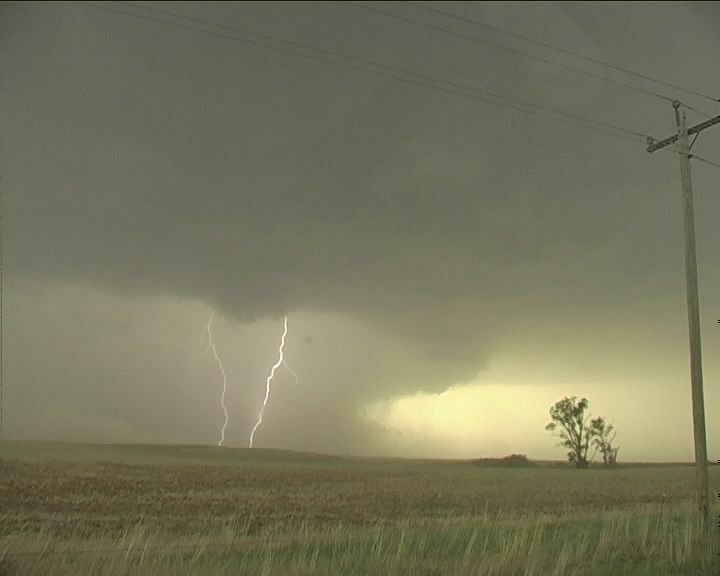 With fading light, limited road choices east and the chaos of these chasers, we headed further southeast for a rest. We did attempt some night chasing and saw power flashes of caused by another tornado and also some very strong straight line winds to 100mph! Finally we headed back for a bite to eat – a great opportunity to discuss this phenomenal day! 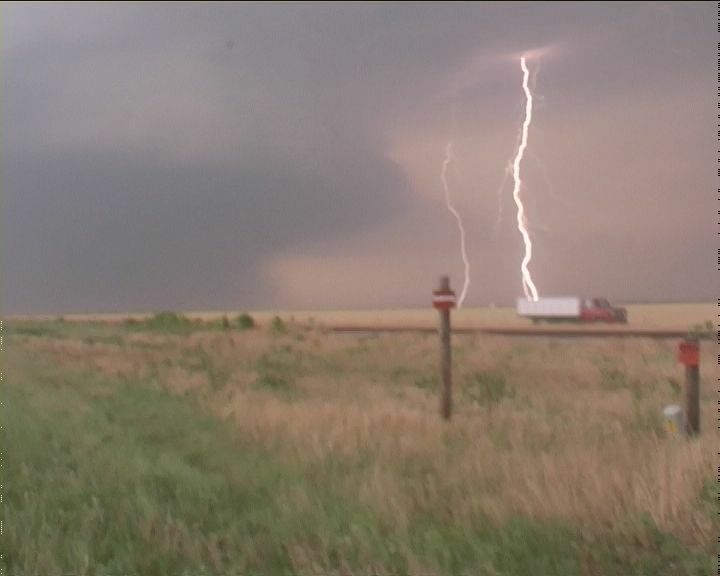 Tornado Alley can produce surprises and this certainly was one of them. 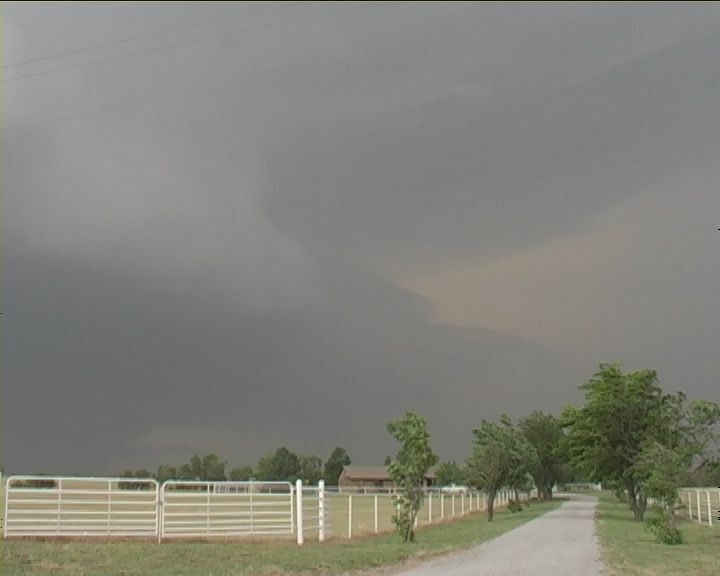 Even watching video of the storm still gives me an adrenalin rush!